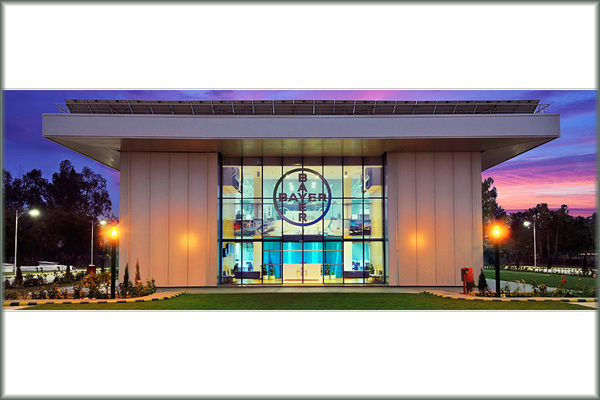 The Eco Commercial Building is part of the Bayer Climate Program which seeks to reduce the company’s greenhouse gas emissions and improve energy and resource efficiency. This administration building is energy self-sufficient, and requires 70 percent less electricity compared to similar buildings in this region. Detailed analysis of environmental conditions were conducted to choose a orientation that would optimize building energy performance. The building form helps reduce heat gain or loss. Native and indige­nous species were selected for land­scaping, eliminating the need for regular irrigation. To help establish the new landscaping, plants were watered twice a day for the first two years. Daylighting is maximized in all occupied spaces. Appropriate shading devices designed through simulation software are used to minimize glare. Integrated motorised blinds are used for occupant’s visual comfort. A design ventilation rate of 30% additional outdoor air over that specified in ASHRAE Standard 62.1-2004 enhances the indoor air quality within the build­ing and provides superior occupant comfort. 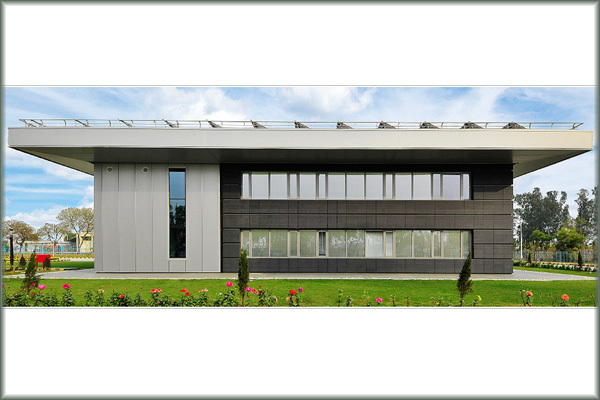 Passive design features resulted in a total diversified AC load of 84 kW for 891 m2 (24 tons for 9,600 ft2). Climatically responsive façade design, including a roof that projects beyond all four sides of the building, protecting it from direct sun and reducing heat gain. All external surfaces, including the walls, roof and foundation, are insulated on the exterior using polyurethane panels. Exterior wall assembly is composed of 150 mm (6 in.) autoclaved aerated concrete (AAC), fly-ash block work and 75 mm (3 in.) polyurethane foam (PUF). Window-to-wall ratio (WWR) is 33.8%, which helps ensure maximum daylighting potential with minimum solar heat gains. High performance envelope insulation leads to 40% reduction in energy use compared with the ASHRAE/ IESNA Standard 90.1-2004 base­line. High performance double glazed windows with integrated motorized blinds provide improved protection against sunlight. Efficient glazing balances the low thermal conductivity and shading coefficient. The building uses regional building materials with recycled content. Low VOC paints, sealants, coatings and adhesives have been used wherever possible. An energy-efficient lighting system with daylighting controls is used. Energy-efficient fixtures and bal­lasts contribute to a 37% reduction in lighting energy compared to ASHRAE Standard 90.1-2004. 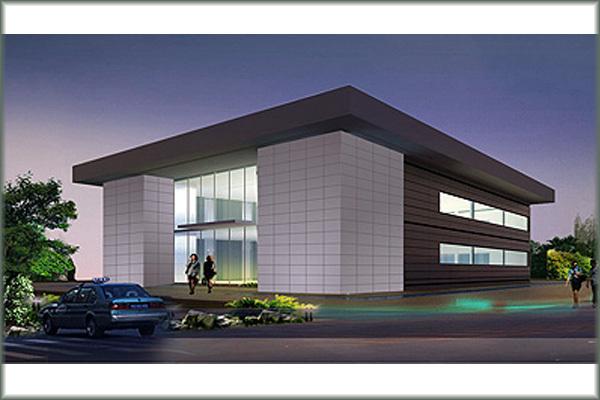 The building uses a combination of energy-efficient T5 linear fluores­cent lamps and compact fluorescent lamps. 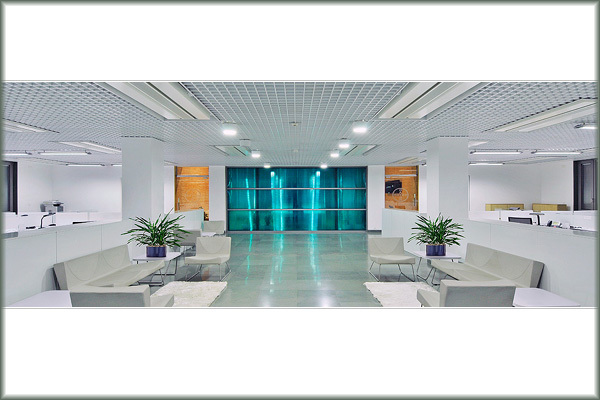 Occupancy sensors in normally unoccupied areas like storage areas, toilets and mechanical rooms mini­mize lighting use. Lighting controls ensure minimum internal heat gain and reduced air-conditioning load in those spaces. Approximately 87% of regu­larly occupied spaces in the build­ing have a minimum daylight factor of 2%. A lighting power density (LPD) of 7.2 W/m2 (0.67 W/ft2) in all occupied spaces is significantly lower than the ASHRAE Standard 1-2004 baseline of 11.8 W/m2 (1.1 W/ft2). Chilled beams for radiant cooling eliminates energy that would be used for supply fans. Chilled water is supplied at 15°C (59°F) rather than at the conventional 7°C (45°F). Based on indoor design conditions of 24°C (75°F) and 55% relative humidity, the room dew-point tem­perature is 14°C (57°F) and chilled water is supplied at a temperature 1°C (0.6°F) higher (at 15°C [59°F]) to avoid any condensation on surfaces. Dry outdoor ventilation air is sup­plied through an externally mounted unit that dehumidifies the air before it is supplied to occupied space. This dry outdoor air acts as primary air to the chilled beams. Air quality is monitored inside the entire building with help of CO2 sensors located 1.8 m (6 ft.) above the floor level in various spaces. These sensors provide an audible alarm to the operator when the dif­ference between outdoor and indoor CO2 levels exceeds 530 ppm. Demand Outdoor Air System (DOAS) starts at 7 a.m. to remove moisture that builds up dur­ing unoccupied hours and brings down the temperature to desired level before office operational hours start. DOAS recovers heat from the building’s exhaust air. Dehumidified cold exhaust air from the bathrooms and office space is collected in each service core. This air enters one side of the rotating heat wheel, chilling the wheel and drying the desiccant coating. This cool and dry part of the wheel then rotates into the outdoor air­stream where it absorbs heat and humidity from the incoming ventilation air before it is cooled to room temperature in the air-han­dling unit (AHU) room. The energy recovery wheel reduces the ventila­tion load by 80%, minimizing operating energy and the size of air-conditioning equipment. The project incorporated ASHRAE-recommended commissioning meth­odology, and used a third-party commis­sioning agent and energy auditor. Design phase commissioning provided early input for incorpo­rating monitoring mechanisms to facilitate successful operation and maintenance by building staff. Construction phase commissioning ensured proper implementation of mechanical and electrical systems. Acceptance phase commissioning required contractors to dem­onstrate the operation of the equip­ment as per design intent. Occupancy phase commissioning focused on proper operation of the systems by the operation and maintenance (O&M) staff. Ongoing commissioning peri­odically verifies operational methods and equipment performance. Draws 100% of its energy from roof-top PV plant. 57 kW PV plant generates 88.9 MWh/yr. Excess energy fed to other buildings at site.